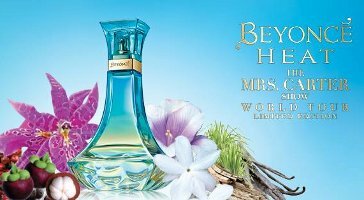 Beyoncé will launch Beyoncé Heat The Mrs. Carter Show World Tour Limited Edition, a new fragrance named for her current world tour, and a flanker to 2010′s Beyoncé Heat. The notes include mangosteen, acai pulp, pink pepper, violet, jasmine, Brassia Edua Loo orchid, vanilla, sandalwood and vetiver. Beyoncé Heat The Mrs. Carter Show World Tour Limited Edition will be available in 100 ml Eau de Parfum. The Loo in the notes list is bound to attract many. I guess that name just encourages people to trot into the store, point and say “I want that one”. What a name! It really does. I would have thought “Beyonce Heat Mrs. Carter” would have been enough. Pepsi, H&M, L’Oreal, her ‘House of Dereon’ “fashion” line….the tour, the fragrances..I don’t need that much of anyone. Thanks. I pay so little attention that I didn’t know about any of that. Robin, all this activity is happening at the SAME TIME! No doubt her people call it ‘brand synergy’ or something equally nauseating. I just call it overexposed. That’s too bad. I’m so out of it I had to google “Mrs Carter” to see what that meant. No idea she had a fashion brand, or anything. The name really is hilariously LONG! Haha! I love the hilariously long name. At least she’s having some fun with it. Ok, whatever, pass. LOL. Heat stunk imo. hmmm i guess Beyonce’ is trying to launch at least 2 fragrances a year to catch up with JLo. lol…GO BEYONCE!